Birds are one of the best known faunal group in the tropics. They are ecologically highly diverse and occupy a wide range of habitats. They have therefore been frequently used taxa indicating the effects of environmental change . Changes in bird communities may reveal successional processes going on in cleared forest. For example, analysis of bird-species inventories from 10 studies revealed that up to 70% of mature forest bird communities may recover in successional sites, and that species composition is about 55% similar to that of mature forests within 25 years . 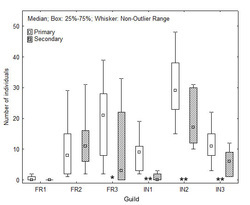 Whatever changes in habitat structure may influence habitat selection and foraging efficiency of all birds, one of the most notable impacts has been the disproportionate effect within different foraging guilds. Studies in Canada, the United States, France, and Papua New Guinea report, that insectivores have consistently declined and are often the most heavily impacted [1, 3-6]. They seem to be particularly sensitive to different forms of disturbance, including selective logging [7-8], forest degradation and fragmentation [9-12], slash-and-burn agriculture , and surface fires . A summary study in agricultural landscapes in Amazonia has also documented declines in insectivorous birds . In Papua New Guinea, shifting (slash-and-burn) agriculture has occurred for at least 5,000 years and is likely to remain the economic base of a large proportion of the population . In the past, shifting agriculture has had limited environmental impact and much primary rainforest has survived. Shifting agriculturalists valued forests as the source of materials and animal and vegetable foodstuffs. Rapid population growth and involvement in cash economies caused a shortening of rotation times, the clearing of much greater areas of primary forest, and in some cases the unintended conversion of secondary forests to grasslands . However, this is not the case in Wanang Conservation Area in Upper Ramu, Papua New Guinea, where most of the cleared areas are small (0.5-1.5 ha) and rotation times long (~10 years). This is due to the fact that the area of forested land (~110 km2) belongs to a small community (~90 people) who clear small new plots of land for gardening, rather than maintaining a large existing one, abandoning their gardens for more than 10 years before coming back (personal communication from community members). I alredy reported preliminary results (see the paper in the end of this page) from a rapid survey of avian species richness and diversity in areas of second-growth and primary forest in Wanang Conservation Area in Papua New Guinea. I further describe differences in the distribution of foraging guilds in the two forest types, and focus my research on other disturbed and undisturbed forests in lowlands of Papua New Guinea. Carignan, V. and M.-A. Villard 2002. Effects of variations in micro-mammal abundance on artificial nest predation in conifer plantations and adjoining deciduous forests. Forest Ecology and Management 157:255-265. Lea, D.A.M. 1976. Human sustenance and the tropical forest. Ecological effects of increasing human activities on tropical and subtropical forest ecosystems, pp. 83-102. Australian Government Publishing Service, Canberra.